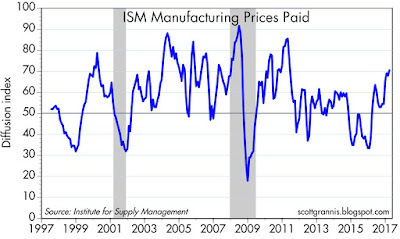 The March ISM manufacturing indices released today were uniformly strong, pointing to an improving economic outlook in the months to come. In this context, the Fed's recent moves to raise short-term rates do not yet constitute a tightening of monetary policy, nor are they a threat to growth. 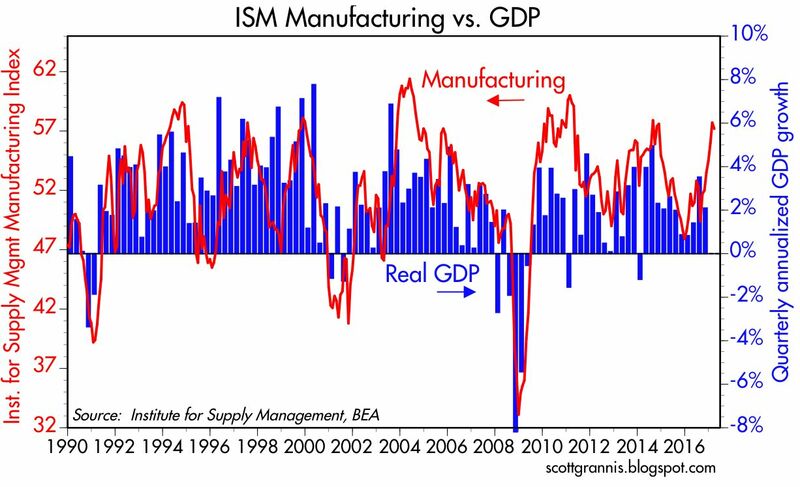 The ISM manufacturing index does a pretty good job of tracking quarterly GDP growth, as the chart above suggests. 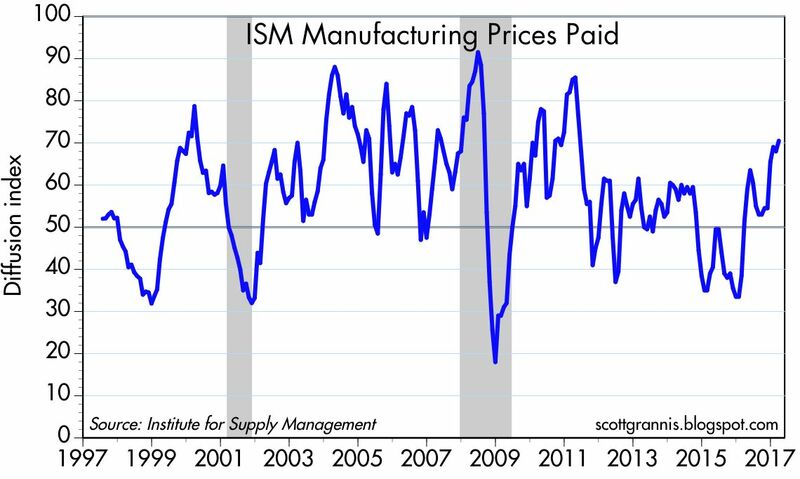 Recent strength in the ISM index is consistent with Q1/17 growth of at least 3-4%, substantially higher than Q4/16 growth of 2.1%. 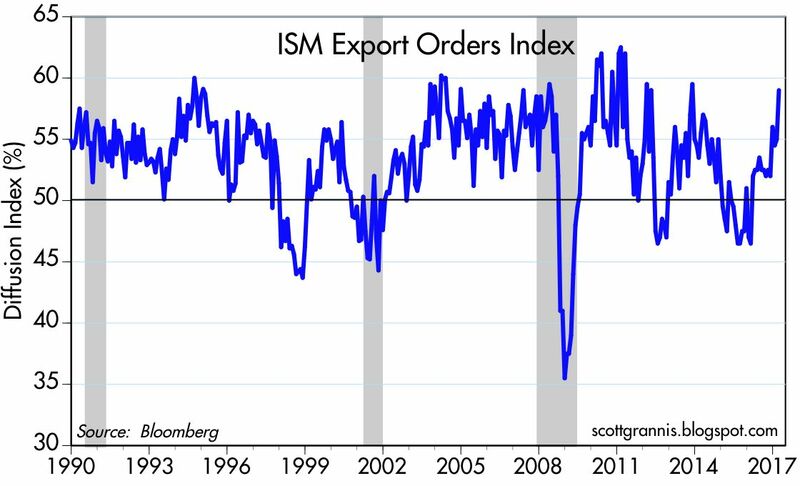 The strong reading for export orders, shown in the chart above, is particularly encouraging, since it likely reflects improving conditions overseas. 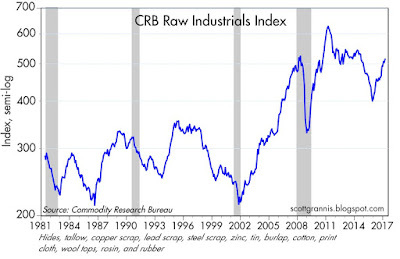 The prices paid index registered its strongest level in many years (first chart above), and that is corroborated by the strength in the industrial commodity prices (second chart). Prices are rising because global demand has proved stronger than commodity producers had anticipated. Manufacturing firms are becoming more confident about the future, as seen in the chart above which reflects optimistic hiring plans. 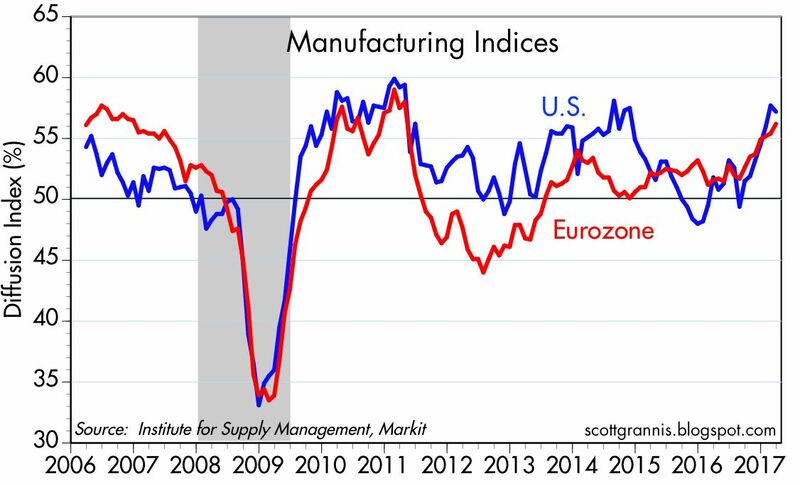 It's nice to see that both Europe and the U.S. are experiencing improving manufacturing conditions. Coordinated recoveries can reinforce themselves. 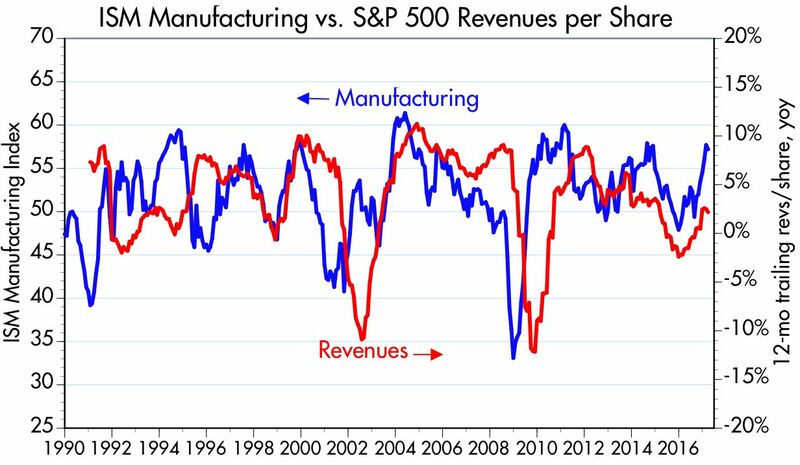 The chart above suggests we are likely to seeing rising revenues per share in the months to come, since the ISM manufacturing index has a strong tendency to lead year over year gains in S&P 500 company's revenues per share. The chart above shows the inflation-adjusted level of the Fed's short-term interest rate target, using the Fed's preferred measure of inflation, the Core PCE Deflator. This is the true measure of the impact of Fed policy, as the Greenspan Fed made clear in the late 1990s. Short-term rates have been negative in real terms for almost 10 years, and are still quite negative despite three rate hikes since late 2015. Negative real short-term borrowing costs incentivize borrowing (because borrowers can repay their loans with cheaper dollars), thus increasing the supply of money (because banks create money by increasing their lending activity) and reducing the demand for money (because negative real interest rates make holding cash equivalents unattractive). The net result is accommodative monetary policy. If the Fed persists in keeping short-term interest rates negative while economic activity and confidence rise, it risks allowing inflation pressures to rise. 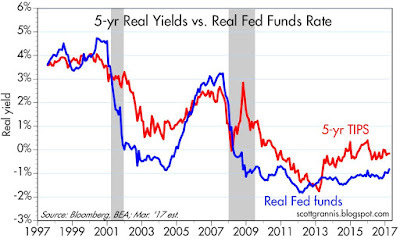 The chart above compares the real Fed funds rate to the level of real yields on 5-yr TIPS. 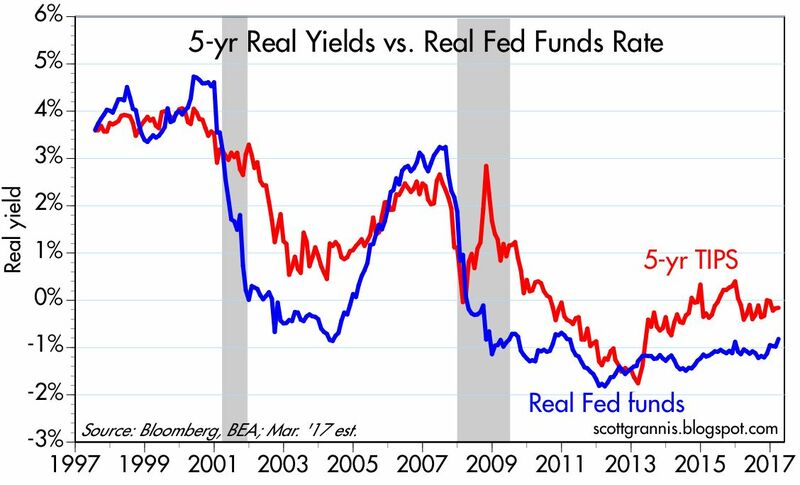 The latter is a proxy for what the market believes the real Fed funds rate will be in 5 years' time. A positive spread between the two indicates an upward-sloping real yield curve, and that in turn reflects the market's expectation that the Fed will likely continue to raise rates in the years to come. The time to worry is when the spread becomes negative (as it did prior to the last two recessions), since that means the market expects the Fed to lower rates in the future because the market senses a significant weakening of economic activity. 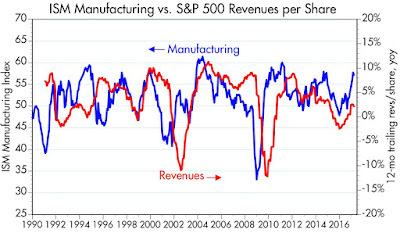 In short, the chart above tells us that the market is comfortable with the Fed's actions to date. 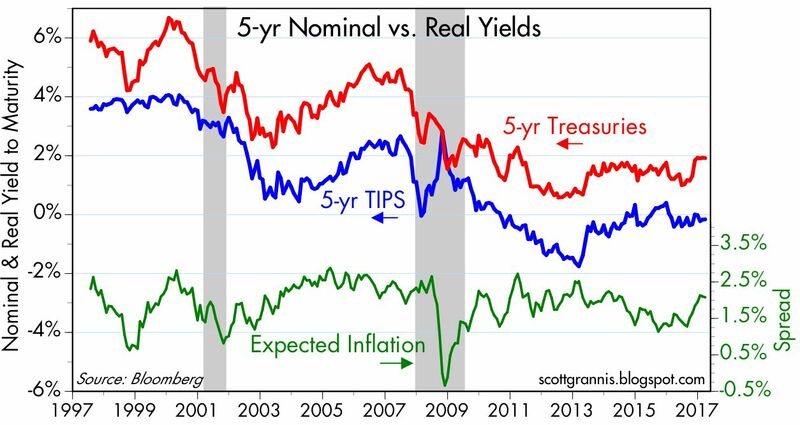 The chart above shows the level of real and nominal 5-yr Treasury yields and their difference, which is the market's expectation for inflation over the next 5 years. So far we see nothing unusual afoot; the Fed has been managing policy in a manner consistent with relatively low inflation. "President Donald Trump plans to hold a town hall meeting with about 50 business leaders on Tuesday at the White House to talk about ways of improving the business climate, his administration said on Monday. The meeting, which will include the chief executives of Citigroup (NYSE:C), Blackstone (NYSE:BX), JetBlue Airways (NASDAQ:JBLU), Mastercard (NYSE:MA) and the New York Stock Exchange, will involve discussions on infrastructure, modernizing government, workforce development and creating a pro-business climate. Senior executives from General Electric (NYSE:GE), Hearst, HSBC Bank, Interpublic Group, Vornado Realty Trust (NYSE:VNO), Centerbridge Partners and Paulson & Co. will also attend. Also taking part will be Transportation Secretary Elaine Chao, House Majority Leader Kevin McCarthy, Commerce Secretary Wilbur Ross and Ivanka Trump, the president's daughter and a senior adviser." Sure, these meeting can be dismissed as symbolic, or ineffective. But Trump has been consistently meeting with business people, sending a signal he thinks they are important. Did our last two Presidents ever do this, aside from a few Wall Street or tech types? I do wish Trump would meet with some regular-employee types too, to send the signal one reason for a better business climate is better wages and living standards. In other words, work together, not at odds. But hey, at least on this score, Trump gets a thumb's up from me. I won't even mention I think money is too tight. 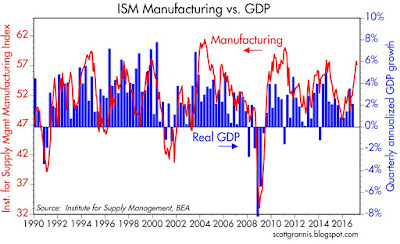 The ISM reading for February was 57.7, a little stronger than March's 57.2, but at least both indicate expansion, the 94th consecutive month of expansion. New Orders were at their lowest since October and vehicle sales were at their lowest since April 2014. I still worry that the Fed will do what it has always done----choke growth with tighter money supply. Last week somebody leaked that the Fed will soon begin unwinding its balance sheet, which I thought it was already doing. I think Scott has a chart on that. I am still awaiting getting the Trump economic agenda underway. The US economy is already in pretty good shape, but I'd welcome robust growth that improves middle class earnings and improves the sense of prosperity in America. Perhaps Scott can explain why it is that although consumer confidence is high, we don't get the feel that America is prospering and families' economic conditions are improving. Benjamin: I'm copacetic with you on monetary policy. You've been so right about the Fed's tightness over the years. 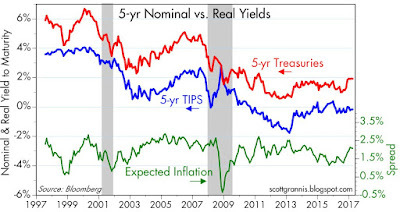 But right now, the gold and TIPS markets, to me, seem to be suggesting that monetary policy is about right. Perhaps one could make the case that the Fed is too tight but only slightly so. What are you seeing to make you conclude that, right now, the Fed is too tight? The only way Trump will be effective is if he immediately starts trying to build a coalition, and perhaps it is too late, rather than attacking everyone who does not agree with him. So far Trump seems unable to understand that leading his own private company is completely different than leading a country where dozens of members of his own party have opposing positions. Trump sold the country a bullsh-t list of everything they wanted to hear -- major items the Democrats wanted (infrastructure "investment", medical insurance to cover more people than ObamaCare, etc.) ... and major items Republicans wanted (bigger military, cut taxes, fewer regulations, faster economic growth etc.). Trump's promises add up to more government spending (which Democrats like but will oppose anyway just to get rid of Trump in 2020), and more deficit spending (which Republicans used to hate under Obama, and perhaps some still do). I do not believe more government spending and more deficit spending are the solutions for too much government spending and too much deficit spending. The indicators mentioned in this blog post are "soft" data -- biased opinions rather than neutral "hard" numerical data -- they are merely coincident indicators, biased by the undeserved business confidence after Trump was elected ... that will fade as he proves ineffective as our nation's leader. First quarter 2017 was weak -- second quarter 2017 is likely to be better ... but averaged together they will be mediocre, just like the Obama years. Many stock valuation indicators are near their highest ever levels -- the median price-sales ratio, for example, is higher than it's ever been. Never before in history has it been wise to buy stocks when valuations are as high as they are today. 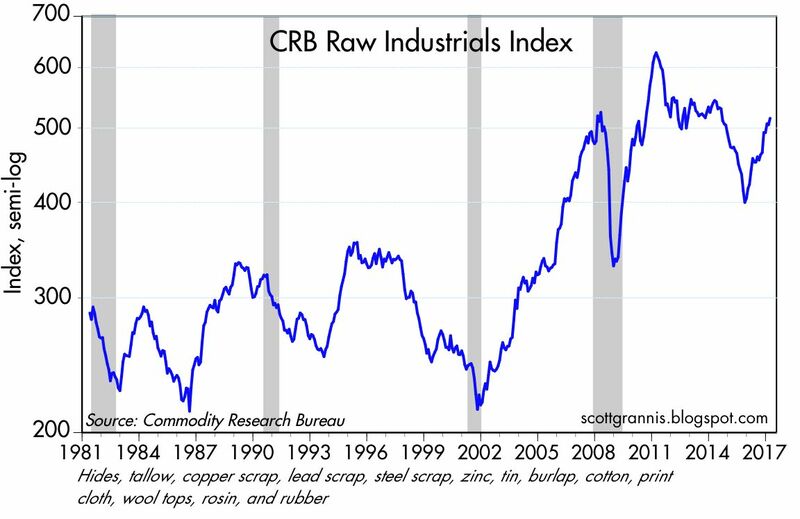 I would like to remind readers of this blog that the author, at least while while writing here, has never predicted a bear market or a recession before it started -- so it would not be wise to expect that pattern to change. Stop-loss orders are your best friend when a bear market starts! Note: I have no bias against Trump. I just report what I see. I favored him over Clinton, who is a crook and liar -- I wouldn't vote for her as dog catcher in my village -- probably would require a Clinton Foundation donation to get your dog back ! Cliff: I went back and checked... Not a single data stream that Scott presented in this particular blog post was "soft" data. 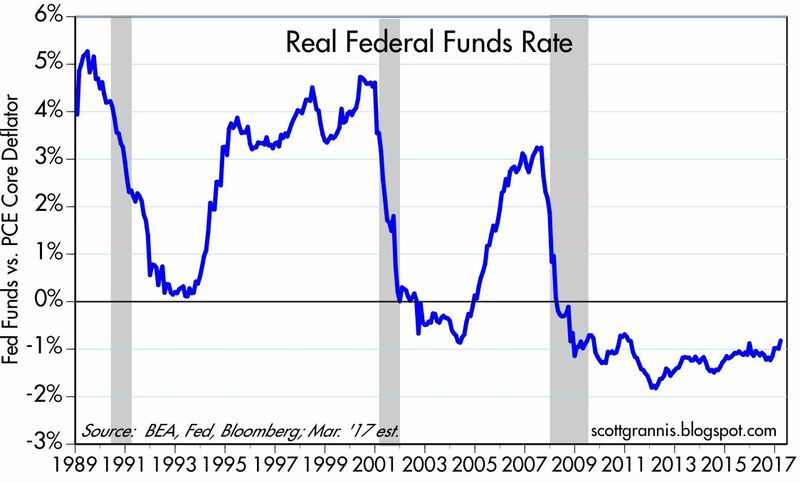 The rate charts are as "hard" as data gets. There are lots of reasons to want a more growth-orieneted monetary policy, including tons of global slack in every industry, and below-target inflation rates globally too (Europe, Japan, US even China). 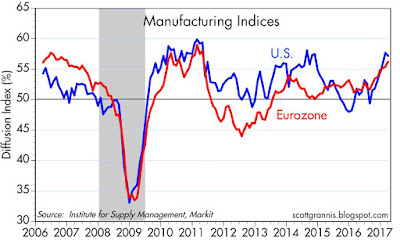 Add on, US labor markets have been getting looser since 2010, according to the Fed's Labor Markets Conditions Index. Add on, Japan has virtually no unemployment, and no inflation. They have more job openings and than job hunters in Japan. Note that Japan is a very stable society, no talk of revolution or upending capitalism etc. That brings ma back to the big reason. I want the voting public to embrace free enterprise. I believe they will, if labor markets are chronically tight. They will rave about free enterprise if we have "labor shortages." Sadly, for atavistic reasons, the US elite has adopted fear of tight labor markets as policy, as seen in the Fed's target of keeping at least one out of 20 Americans who want to work unemployed, the de facto open-borders policy, and the self-destructive managed trade policy. Add to the above to the embrace of property zoning (and thus high housing costs) by propertied and financial elites, and you have a recipe for Trump and Sanders. Like I said, there is blue kool-aid and red kool-aid. Man, I would like a drink of cool, clear water. If I could wave a wand, I would end property zoning in America, start phasing out a lot of social welfare and warfare programs, and shoot for labor shortages and rule of law in immigration matters. Trade is a complicated issue, more complicated than the anti- or pro "free traders" want to admit. But back to the main topic: The Fed seems to think it must keep a large body of Americans unemployed at all times. I disagree. You may be mistaking the word "soft" to mean weak data -- normal people would think that way. Economists mean something else by "soft data" (opinions rather than numerical "hard" data). 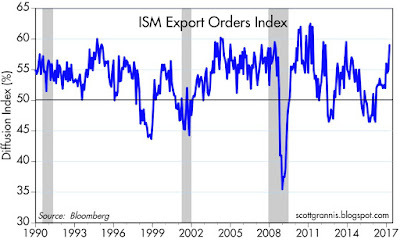 Six of the first seven charts include ISM "soft" economic data. Soft data are opinions (such as getting better vs. getting worse, growing vs. shrinking, up vs. down). 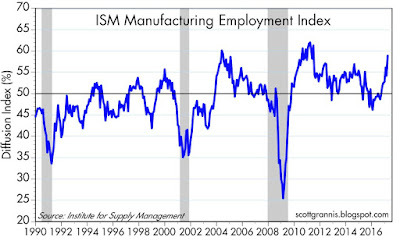 ISM gets no hard data (numbers) from the firms they survey. People at the firms may base their "thumbs up / thumbs down" votes on hard data. or not, we don't know. Normally there is nothing wrong with soft data, especially when averaged over a few months. After Trump was elected there was a huge surge of consumer and business confidence (also soft data). 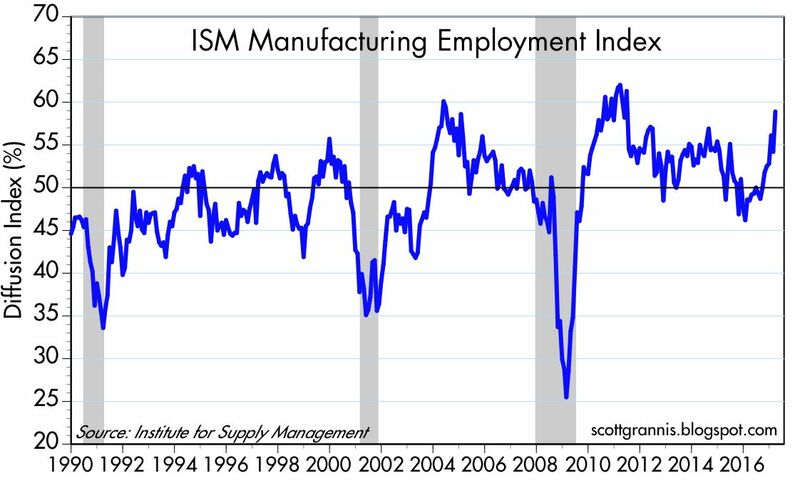 If business confidence is unusually high, I would expect upward / bullish bias in other soft data such as ISM surveys (formerly Purchasing Manager;'s surveys). With the unusual gap between soft and hard data so far in 2017, I prefer to trust the far less bullish hard data.